The thing about pasta is, that you can either make it super heavy and fattening, or you can try to tweak corners and end up with a lighter dish. Don't get me wrong, grilled fish and steamed veggies will still shed pounds faster, but this is a not so naughty lasagna :) Since I cook and eat quite a lot, I try to balance meals, without sacrificing taste.. 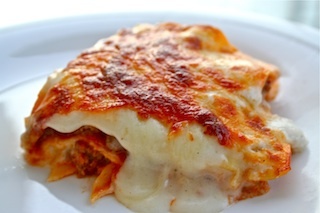 In this recipe I used lean meat, avoided a buttery, white sauce or full fat cheese, and still ended up with a delicious lasagna! You can't even tell this is a skinnier version.. Honest! Don't be intimidated by the long list of ingredients, it's really quite simple to make.. In a sauce pan, heat the olive oil and flour until it turns slightly golden brown, and add the milk, nutmeg, salt & pepper to taste and bring it to a boil.. Reduce the heat and simmer, stirring occasionally until it thickens, then add the cheese and set aside..
Preheat the oven to 200 C.. In another sauce pan, heat some olive oil and add the onions and garlic.. Cook it for a bit, then add the peppers, celery, carrots and cook it for a minutes or so.. Add the minced meat, then the Worcester sauce, all spice, oregano, basil, and bay leaves.. Sautee it for a few minutes, add the chopped tomatoes & sauce, salt and pepper to taste.. Simmer the meat mixture for about 25 minutes, until everything combines and thickens and resembles a meat ragout..